Does fear strike your heart when tax season rolls around? Are you confused about business structures, unsure about what you can and can’t deduct, and annoyed with how complicated this all seems? Not anymore, friends. Here’s a secret: it’s easier to save a dollar in taxes than to make a dollar by getting more clients – and we’re all about making your life easier and making you richer. Smart tax planning and corporate structures can become a compounding interest machine that gets reinvested into your business year after year. 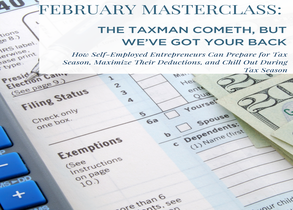 At this master class, we’ll be showing you the most pertinent things that self-employed entrepreneurs need to know about their taxes – and most importantly, making it fun, interesting, and easy to understand. We’ll discuss how different business structures like LLCs and S-Corps are taxed; show you what deductions to pay attention to; explain how to get the most out of the deductions available to small business owners; and answer any questions you’ve always wanted to ask a CPA about your taxes. You’ll walk away ready to face tax season like a badass!